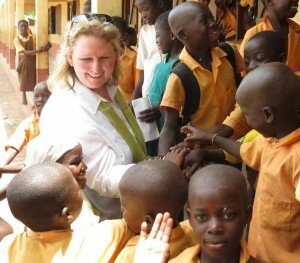 Debra with schoolchildren in Kpachelo, Ghana. During this monitoring visit, I am travelling with CFTC Board director and incoming Board Chair, Derek Briffett, along with his lovely wife Darragh and their daughter Michelle who has just graduated from Ivey Business School. It’s a great opportunity for them to familiarize themselves with CFTC team and operations in Ghana, spend time with local partners and with the women, men and children in the communities we support, and learn more about Ghanaian culture and people overall. Lots to do in ten days, including travelling the breadth of the country from southern Cape Coast to the Burkina Faso border. Very hot on arrival in Accra … however once we hit Tamale, the heat thickened and it has been 40 degrees C. or above most days, shade or no shade. We Canadians are sweating buckets just standing still! 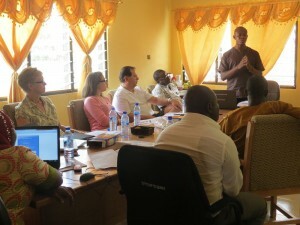 Briefing at CFTC’s country office in Tamale. Great to meet with the whole CFTC team on arrival! Our new CFTC Ghana Country Representative, Edward Akapire, met us at the airport along with James Ayando, the Project Manager for our new CIDA CHANGE project which is now underway supporting smallholder women and men farmers with climate change adaptation initiatives for agricultural production and economic alternatives. At the new CFTC offices we caught up with the rest of the team: the amazing Augustine N-Yokuni, our Country Program Officer who has led the local logistics for our visit; Salma Abdulai, Monitoring & Evaluation (M&E) Officer for the CHANGE Project; Finance Officer Oliver Abegmi; and our drivers Emmanuel Afayure and Mohammed. The CFTC team interspersed with the RAINS team. The three northernmost regions of Ghana are significantly poorer than the south, and for this reason, CFTC has been working with local partners there since 1999 to support community development. 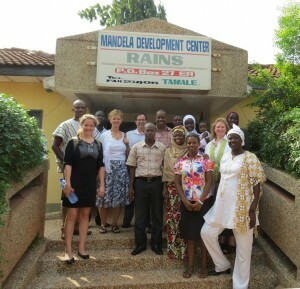 Our longest-term partner is local NGO, Regional Advisory Information and Network Systems (RAINS) based in Tamale, the capital of Ghana’s Northern Region. We kick off with a briefing highlighting RAINS’ work and areas of focus at their offices hosted by Executive Director Hardi Tijani. Next we meet the new Regional Minister, the Honorable Bede A. Ziedeng. This is a role that reports directly to the President and it is a very official visit. The Regional Minister has been in the role for just a few weeks and he is both gracious and informative on the development needs of the region. He highlights the importance of coordinating activities with other local and international agencies to ensure that the communities with greatest need do not get overlooked. This is an important point for agencies to align to ensure both equity and sustainability of interventions across the Northern Region. On our way to Kpachelo and our first community visit with RAINS, we also meet with the Municipal Chief Executive for the Savelugu-Nanton Municipality, the Honorable Prince Askia Mohammed – and while this elder is in the final days of his tenure, he welcomes us warmly to the district and speaks highly of the work of RAINS. Always good to know our selected partners are well respected and integrated with the local leadership and community priorities. Then onwards to Kpachelo. First we tour the school and meet some of the children. 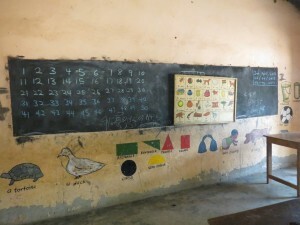 We have a chance to walk through the classrooms that RAINS built with support from CFTC. We also see the feeding centre where late morning lunch is provided to ensure that the children stay the morning before returning home for the afternoon. This education work is part of our core programming in Ghana. Derek Briffett, incoming CFTC Board Chair, meets schoolchildren in Kpachelo. We next move on to a lively session with the School Management Committee and the five teachers, and while they offer appreciation for support this far, they also highlight further support needs. This is the kind of feedback that helps to bring our community-led development to life. Next stop is a very formal meeting with the Village Chief and his Cabinet – elders who form a local government within the village, a traditional method of ruling that dovetails with the current political system. This is a time to accept his gracious welcome, to offer our appreciation for commitment the community has shown to bring projects to life. He is an older man who has lost his sight, and is sitting on a raised platform on the far side of the tukul hut we’re in – called the Chief’s Palace. He is dressed like the rest of the men in a traditional striped smock and embroidered cap with a rainbow of kente cloth shawls wrapped around his shoulders. Did I mention that it is over 40 degrees C. outside? Meeting Village Chief and his Cabinet. Our delegation sits on one side of the hut facing the Cabinet and we are only allowed to speak to the Chief through his spokesperson: a Chief of Staff, if you will. He introduces us to his Cabinet, including his Minister of Defense and Vice Chief – and then goes on to highlight the importance of the empowerment of women in this traditional Muslim community, and the importance of water to support both the needs of the people and the needs of agriculture. 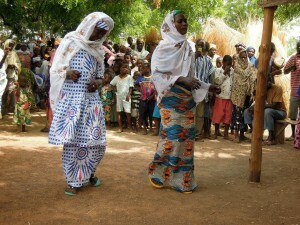 Women of Kpachelo in beautiful garb. The Minister of Agriculture for the community leads us from the Chief’s Palace in a dance with drums and music to the durbar, a community gathering and celebration. The women are dressed in beautiful colours on one side of the gathering, and the men in a mix of traditional dress and t-shirts on the other. There are speeches, dance and questions. In addition to our core programming in Kpachelo we are also implementing the CIDA-funded Climate Change and Adaptation in Northern Ghana Enhanced (CHANGE) Project with a focus on supporting women farmers in the use of indigenous seeds to increase their crop production. The women come forward and display some of the seeds they will use for the season ahead, and you can feel their pride – and that of the men too – in their empowerment. Feels good to know that our work is focused and harmonized on community priorities – and that our community-led approach to development is making a difference. Takes time, but greater potential to last the longer term.